Can I Make a Living From …? This was one of the first few questions that I practised on using horary astrology. The equal house system is used as the chart was cast when I had extremely limited knowledge of horary astrology then (and now too). In addition, at the time of the reading, I didn’t realise that a planet that’s within 5 degrees of the next house cusp belongs to the following house. I stuck to my original interpretation as it’s the universe’s way of talking to me at that point in time. Ascendent is in the late degree – it’s too late to be asking this question. The person (querent) might have already embarked on a course relating to the knowledge. The profit from the knowledge is represented by the 10th house and its ruler – Venus. There’s no planets in the 10th house. Venus is exalted so there can be quite a lot of profit from the knowledge. Venus is in retrograde, suggesting to me (although others may disagree) that the profits “returns” or goes to the querent. 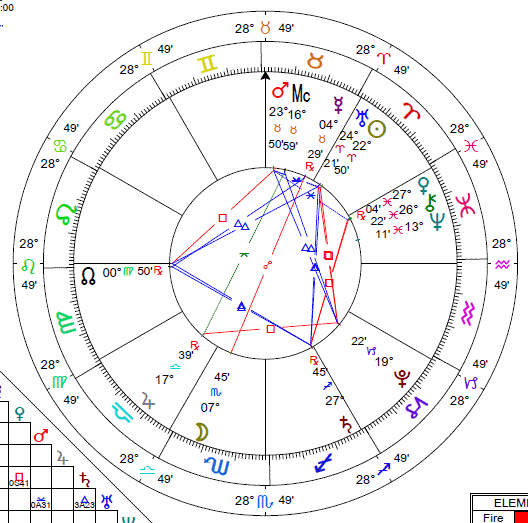 Is there a connection (aspect) between the querent (Sun) and the profit from the knowledge (Venus)? No, there’s none. Is there a connection (aspect) between the querent’s knowlege (Mars) and the profit from the knowledge (Venus)? No, there’s none. It’s interesting that Mars is in the sign of Taurus, which makes it debilitated. This indicates that the querent’s knowledge is weak and perhaps rudimentary. What About the Client’s Money? The customers’ money is represented by the 8th house – there’s the Sun in the 8th, suggesting that customers “burn” their money. This is good news! I don’t know exactly what to make of Uranus if it is used except that their money can come and go unexpectedly, suggesting irregular income streams. Although Uranus is in combusion of the Sun, perhaps diminishing the effect of Uranus’s unpredictable nature. The ruler of the 8th is Jupiter in 17 degrees Libra. Jupiter is in the term, so the amount of the customers’ money is so-so. Jupiter being retrograde in the querent’s 2nd house suggests that the customers money will come to the querent’s own pockets. Not a bad thing! There’s no aspect between Jupiter, Lord 8 and and Venus, Lord 10, suggesting a connection between the customers’ money and the profits from the knowledge. There’s no aspect between Lord 8 and Mars, Lord 9, suggesting a connection between the customers’ money and the querent’s knowledge. Can the querent take advantage of any monetary opportunities from his knowledge? Yes! The Sun, which represents him, is exalted in Aries. The north node is very close to the Ascendent, possibly suggesting that he is enhanced by the nature of the question – making a living from the knowledge. Hmmm, could the south node in the 7th/conjunct the 7th suggest that the querent’s customers are weakened from the querenent’s limited knowledge (Lord 9 – Mars in Taurus is debilitated). Yes, the querent can make a living from his limited knowledge. Indeed, there’s the potential for huge profits. However, his customers might have limited money. So, maybe, he could explore other areas to use his knowledge to make profits, for example books, writing, teaching which are 3rd house matters and ruled by Venus which is exalted. Should I Put Up an Advertisement?